Happy Wednesday! I've been away from the laptop for the past several days, just taking a bit of a breather while I attend to some real-life things. I miss this space acutely when I don't visit often enough. I was really glad when Yarn Along day rolled around. I like the way a weekly prompt focuses my time and attention. I joined in last May, hoping Yarn Along would keep my long summer break feeling more organized and purposeful, and here I am six months later, still finding the same important reasons to stay involved. It makes me happy. This week, I'm working on Hensfoot and a few other small gift projects behind the scenes. Sadly, I have learned that someone no longer wants my handmade gifts. This truly breaks my heart. I know most of you would feel the same way. But maybe it's also a blessing, since I was falling behind on my gift projects for the holidays anyway, and this will take some of the pressure off. If there's one thing I've learned, it's that making, and giving, should be joyous. I'm reading a wonderful book that I won in a recent giveaway. Modern Vintage Gifts is the latest book by our talented blogging friend, Helen Philipps. She gave away two copies of her new book on her blog, and I was one of the lucky winners! It's a beautiful book, full of lovely project ideas, and I can't wait to give them a try. Thank you, Helen! Thank you for joining in with my Winter Project Link Party! The November party is live until just before midnight on Friday; if you haven't already joined in, you still have plenty of time to do so. It's fine to link up with a post you've already written about your projects, it doesn't have to be a dedicated post just for the party. All I ask is that you include a link back to the party post so that others can join in too. It just helps spread the word. I've been happy to hear that some of you are getting new traffic from the party, that's exactly what I had hoped would happen. I hope you're finding motivation and inspiration too. That stinks about the rejected knitted gifts. But at least you know, and you can knit for someone who truly appreciates it. I think my mom appreciates my knits the most since she's a failed knitter, and knows how much work goes into everything I make. Enjoy your holiday knitting/gift giving! Hi Jennifer, thanks you for your visit by me. You did make me happy. I like "yarn along" too. I have to send my crocheting to Ginny. 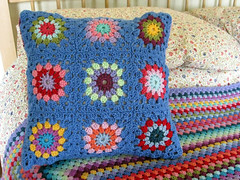 Your hensfoot blanket is lovely, as are all your makes...how sad that someone is unappreciative of the time and love you put into your beautiful knitted and crocheted creations. A handmade gift is so special.....I have a friend who makes me shawls and other knits for my birthday and Christmas presents and I love that she made them specially, they mean so much. I am so glad that your book arrived safely, and thank you so much for your sweet words and the links too, dear Jennifer. Wishing you plenty of happy crafty November days. I remember distinctly when I made pinafore dresses and blouses for 2 nieces' Christmas gifts when they were about 4 and 6 years old. The older girl unwrapped hers and said "Och, not more homemade stuff!". I was horrified! No child thinks things like that - it must have come from the parents so that was it for me. No more "homemade stuff" for them! And, although it upset me greatly at the time, it was actually easier in the long run. No more worrying about what size they were or what colour they liked etc. etc. I'm sorry you were upset but I hope it will be better for you in the long run too. As you say, making things for people should make us happy too! I don't know how I would react if someone told me they didn't want handmade but I know it would make me sad, really sad. I am so sorry that someone has told you that recently. Neither one of my children wants handmade gifts. Sigh. I figure someday they'll wise up! That is a beautiful book. If only I could sew! What a nice thing to win, and perfect for you! Sorry about someone not appreciating your handmade gifts. I think they are special because of the time and love that is put into them. I would be sad too, because I think it's such a personal gift. Sorry about your handmade's rejection. Oh well, Their loss. I can understand that handmade gifts are so very personal that it weirds some folks out, they can get very specific. But that just means you'll have more time to do as you wish! Your hensfoot looks wonderful and I covet it! Congratulations on winning that lovely book. The pictures on the cover are enough to tempt anyone. So sorry to hear that someone doesn't wish to receive one of your beautiful gifts - it does sound a bit weird, but sometimes non-crafters don't realise the time, care and love which goes into making a special gift. Handmade gift is such time and such a thing you think about to give it to the right person!! that sounds so bad for you someone doesn't want your gift. But be confident that what you do with your hands is beautiful and made with great taste. with the fact I live the other side of the planet, it is hard to be on time with you post sometimes, but be sure I continue to follow it and to follow the winter project party. How could someone not want a homemade gift from you? How very ungrateful. I love homemade gifts, I think of the time and effort that the person who made it has put in to it, and all for me, it makes it so special. Try not to take it to heart and just concentrate on the lovely people who do appreciate your gifts. I agree. I think a handmade gift shows so much love and thought. I had a look at Helen's website and she does create some beautiful toys and decorations and quilts, lucky you winning a copy of her book. 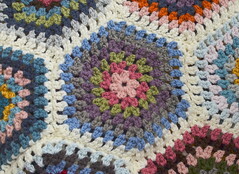 Your glimpse of blanket looks scrummy, I just love the muted vintage colours you're using. I'm so sorry that your thoughtful gifts are not appreciated. I wear the socks that Christina (A Colourful Life) knitted, and I won, every evening! They get better and softer each time. 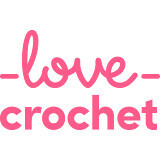 I love to receive anything homemade; cakes, bread, jam, crocheted brooches. I really enjoy giving away things that I have made as gifts. I always give people homemade goodies for Xmas. I get so much pleasure out of it. I don't know how I'd feel if someone rejected it. Very upset probably. So a big hug to you from me, and a big fat raspberry to that ungrateful person. Such a shame that your handmade gift is not appreciated, it wouldn't do for us all to be the same and crafting is not for everyone. Your book looks amazing.